1. Evaluate your business’s current financial standing. Review your business bank statements from the last three months. Do you deposit at least 10k / month? How many NSFs do you have? Less than 3 per month and you’re in the clear! Are your daily ending balances relatively stable? Like the real estate space, the MCA industry is saturated with brokers. Make sure you choose a seasoned professional that you can trust and that has your best interests at heart. Do your research on social media and Google. Do they have a presence? Are they rated? How do they fair? Check out their website. Do they have a brick and mortar location, or do they operate from a virtual office? How long has the company been in business? These are all things to consider when seeking a broker to partner with. Have 3-6 months of bank statements from your operating account ready. Be prepared to provide statements from your payroll and other transfer accounts, if applicable. If you run a seasonal business, you may be required to produce one full year of bank statements. Remember, once you’ve been entered into the industry database as a business owner seeking capital, you may see an uptick in the amount of calls you get from funders and brokers alike, offering you far more money than your current broker, but this is simply a gimmick. This is another reason why choosing the correct broker is so important– it provides you with peace of mind. If you trust your broker and their expertise, you will not be easily distracted by flashy language and tall promises that never materialize. Stay the course and communicate with your broker. 6. Once your broker presents an offer, feel free to negotiate. It never hurts to ask for a longer term or a little more money. However, trust that your broker is working hard to get you the best possible deal. If your broker makes it clear that an offer is a funder’s best and final, take their word for it. Business owners constantly walk away from good offers because they think they have a chance at finding a better offer elsewhere, only to come back to their broker after a few weeks with a bruised ego once they realize that a better offer doesn’t actually exist. Typically, they’re in an even tighter financial spot and the offer they received a mere month ago no longer stands. Once you’ve gotten an offer you like its time to fund! Mortgage statement, recent rent checks, lease agreement, etc. Depending on the size of the advance, you may be required to sign a COJ and have the document notarized. Have no fear! Ask your broker to walk you through the legalities of the COJ. Its just a piece of paper, and if your intentions are pure and failing to repay your advance and skipping town is something you’d never entertain then you have nothing to worry about! Funders love nothing more than a consistent client. Typically, if you displayed trustworthiness and solid repayment habits, you will be eligible for a renewal once your advance is roughly 65% paid back– sometimes even qualifying for more money than you were originally funded for, simply because of your good behavior and consistency. 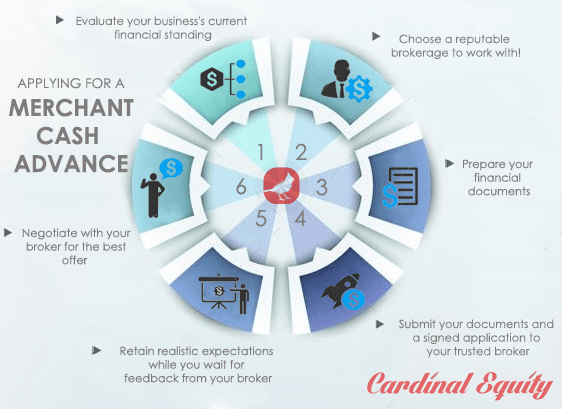 A Merchant Cash Advance is an excellent alternative to a traditional bank loan. Understanding the process and partnering with a good broker is crucial to having a positive experience and for qualifying for cash advances in the future.